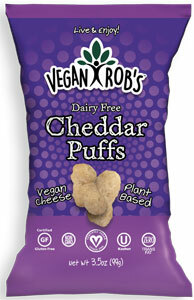 Finding good "cheesy" snacks to replace your favorite treats isn't always easy, but Vegan Rob's has changed this with their new Dairy-Free Vegan Cheddar Puffs! Made with simple organic and non-GMO ingredients to give you the best nutrition when you snack, these delicious puffs taste amazingly like those old non-vegan snacks you may remember from your past, but there's no guilt when you indulge in these! Not only that, they're gluten-free, kosher certified, and have no added sugars, making this the perfect choice for vegans who are conscious about their health as well as flavor! Large 3.5 oz. (99g) bags are $2.99 each. From Kelsee of Pierre, South Dakota on 4/17/2017 . I didn't expect much from these vegan cheese puffs. To me, they were a bit harder than a regular cheese puff and the cheese flavor was lacking. Not to say it wasn't good though. This tasted more akin to a butter puff, rather than a cheese puff. I'm unsure whether I would get another bag in the future, but I did enjoy trying something new. From Anonymous of Chicago, Illinois on 4/16/2017 . From eggplant of vIneland, New Jersey on 2/24/2017 .